We can design and create effective, stunning collateral pieces that will reach your target audience at their businesses or homes. 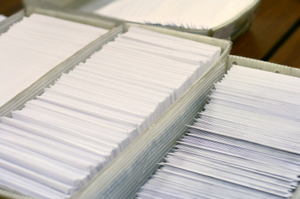 We print a variety of products that are used for direct mail and stock a large variety of envelope sizes and colors. We print postcards, flyers, letters, self-mailers, business reply cards, or anything else that you need to put into the mail. We complete the project by either using your mailing list or procuring a mailing list using your specifications and addressing the printed pieces plus applying barcodes and sorting for maximum postal discounts. Your campaigns success depends on how you can tailor your lists to match the audience you are trying to reach. To raise your ROI (Return On Investment), you need to know who would be likely to purchase your product or service. Then select those clients by using demographics - either by your existing client list or purchasing a list from us.